NEW DELHI: A video of a religious ceremony has been viewed more than one million times on Facebook posts alongside a claim 350 people “accepted” Islam in New Zealand after last week’s deadly mosque shootings. The posts are misleading – the video is from an unrelated Islamic event in Germany available online since 2007 – and contain no other evidence to back up the claim of 350 people accepting Islam in New Zealand in recent days. The 90-second video starts with a bearded Caucasian man wearing a skullcap passing a microphone to another man, who then speaks in Arabic. It continues with a ceremony spoken in Arabic and German. The video was viewed more than one million times in 48 hours after being uploaded on Monday to the Facebook page of Sajid Hashmat, who identifies himself as a “senior leader” with a regional political party in India that represents Muslims. AFP created an archived version of this false post (1). The post was published after 50 worshippers in two mosques were shot dead in the southern New Zealand city of Christchurch on Friday. An Australian man has been charged over the murders. AFP found dozens of other posts with the same video and misleading caption on Facebook and YouTube, some of which had been viewed tens of thousands of times. Through an investigation using video analysis tool InVid and multiple keyword searches, AFP established the video appeared on YouTube on November 24, 2007 (2). 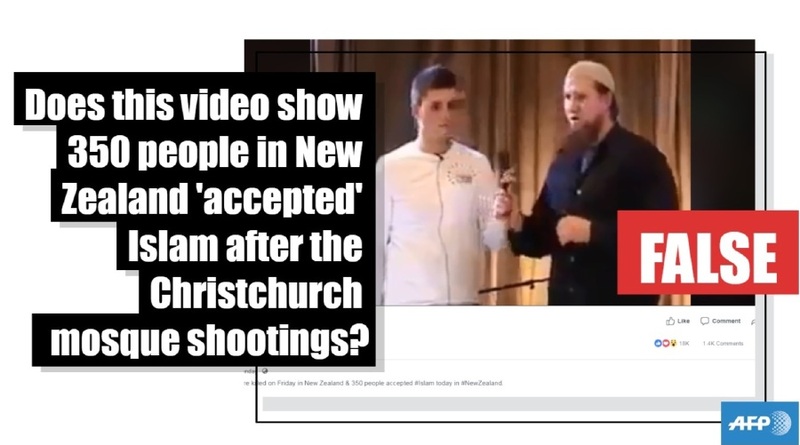 AFP contacted Hashmat to ask why he posted the video alongside the caption, and whether he had any proof to back up his claim that 350 people had accepted Islam in New Zealand after the attacks. The link he referred to was a blog post that similarly made the claim of 350 accepting Islam, without citing any evidence or sources. AFP published a blog post on Wednesday that gives an in-depth report on its investigation into the misleading posts (3). Fact-check: Was a deputy minister wearing a Communist uniform? Fact-check: Did a baby survive an Indonesian plane crash?